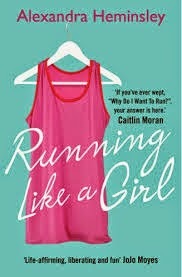 a book chick: "Running Like a Girl"
my take: I took up running in 2014 when I turned *SHOCKING* 50 and probably wouldn't have been interested in such a title before that. And now that I'm *TA DA! * a runner this was loads of fun. Fast, fun read full of British mannerisms which includes her research on pioneer running women and her suggestions for beginner runners.